The clivus is a bony part of the cranium found at the skull base and is a shallow recession at the back of the dorsum sellae that inclines obliquely backwards. It creates a gradual sloping process at its junction with the sphenoid bone at the forward most part of the basilar occipital bone. 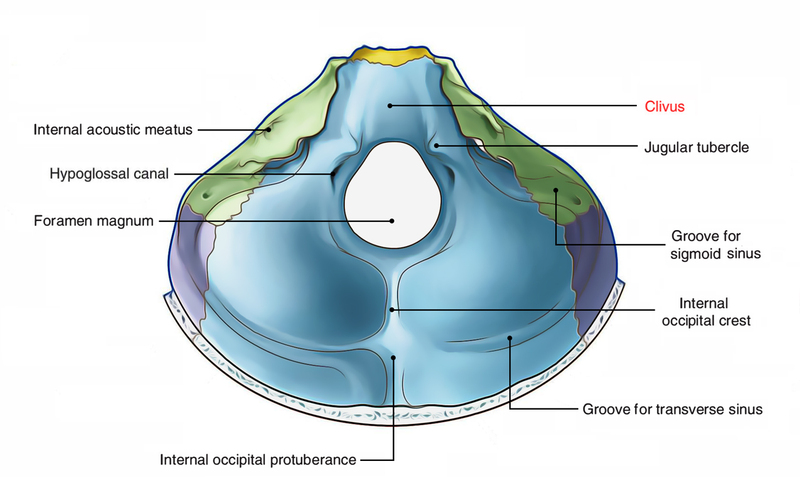 It is positioned just posterior towards the sphenoid sinuses on axial levels. Immediately lateral towards the clivus bilaterally is the foramen lacerum where the internal carotid artery arrives at the middle cranial fossa over the foramen lacerum, proximal towards its anastomosis with the Circle of Willis. The basilar artery is posterior towards the clivus. Inferiorly the clivus is surrounding by the rounded prominences of the jugular tubercles which correspond to the fusion of the bassiocciput together with the lateral jugular portions of the occipital bone. The clivus is filled from the medulla at the plane of the jugular tubercles. The clivus is wider as well as filled by the pons over the jugular tubercles. Furthermore, anatomically it is closely associated to the basilar venous plexus as well as pontine cistern.